When your pet goes toward the edge of the pad (as they always seem to do) you’ll be happy about the 6-layer construction and InstaShield technology. 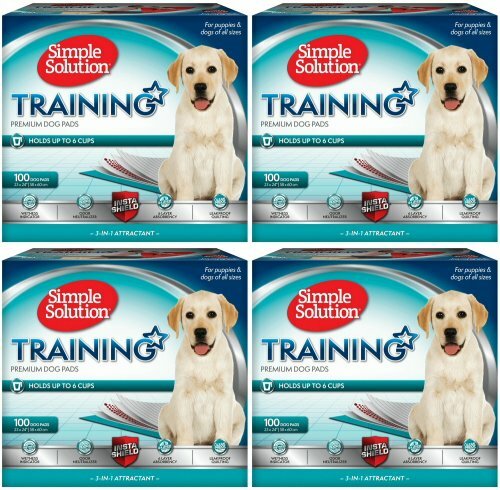 Simple Solution Dog Training Pads contain everything, including the odor. The attractant means your dog with find and use the pad. The new wetness indicator means you’ll know they have. Now 100% more absorbent - holds 10 times more liquid than standard economy pads. Accelerates training time by encouraging instinctive elimination. 5-layer construction traps more urine for repeated use or larger, breed pets. 23" x 24" each 2 boxes of 100 pads. 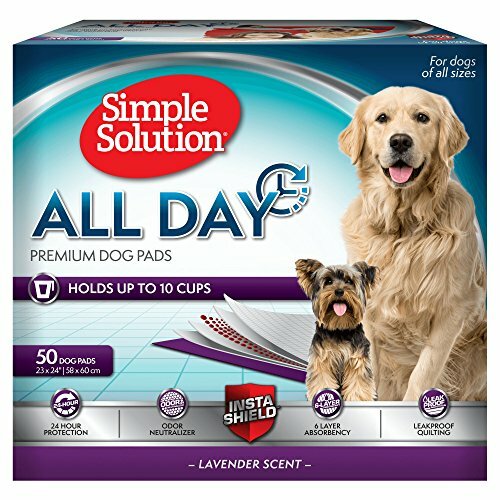 Simple Solution All Day Premium Dog Pads, 23x24 (50 ct) is proud to introduce the All Day collection to our best-selling line of premium dog pads. Powered by InstaShield Technology, these lavender-scented premium dog pads deliver 10x protection and eliminate odors to keep your home clean and smelling fresh all day. 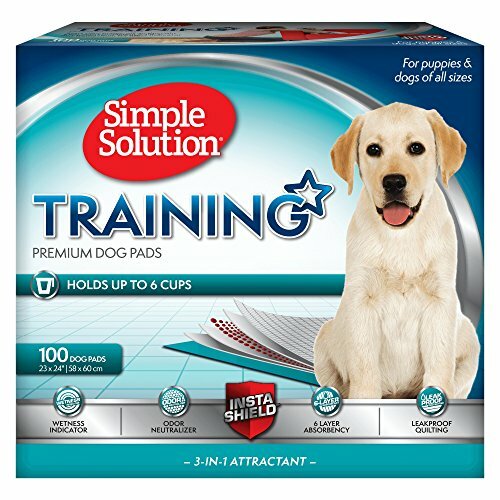 Simple Solution All Day Premium dog pads hold up to 10 cups of liquid and helps eliminate unpleasant pet odors. 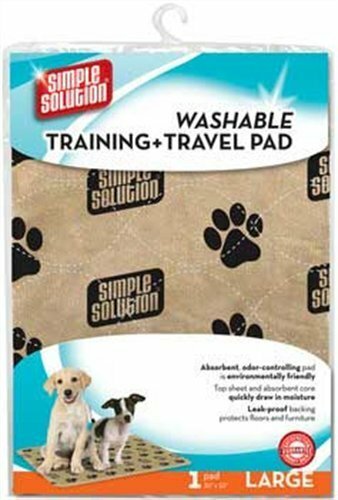 It works great for multi-dog homes and pets that need to stay inside for extended periods. Contains 6-layers of guaranteed leak-proof protection. Features tear resistant top sheet with diamond-quilting to quickly pull moisture into the core to prevent puddling and tracking. 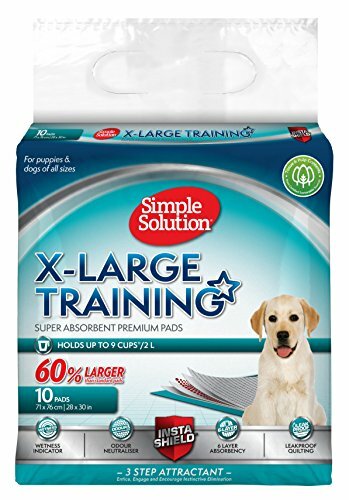 Simple Solution Extra Large Dog Training Pads are 28 inches by 30 inches (60% larger standard pads) with a five-layer construction that uses an advanced polymer technology to trap more urine and lock-in moisture, preventing runoff and messy tracking. 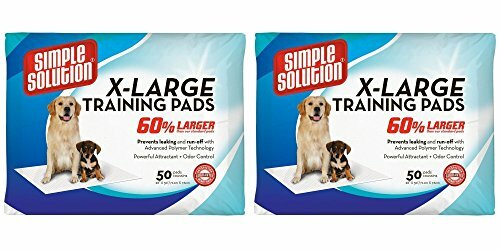 Simple Solution Extra Large Dog Training Pads (10 ct) are 28 inches by 30 inches (60% larger standard pads) with a five-layer construction that uses an advanced polymer technology to trap more urine and lock-in moisture, preventing runoff and messy tracking. 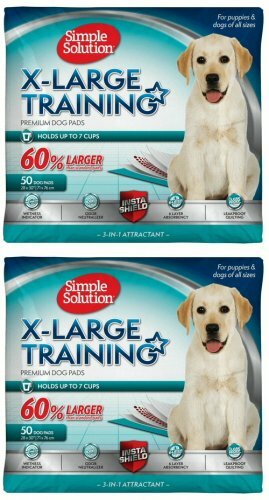 Our dog pee pads have a powerful built-in attractant to help accelerate dog and puppy potty training and housebreaking. 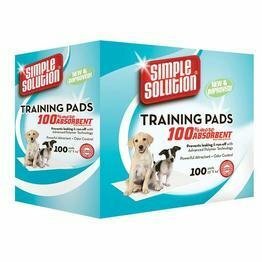 Simple Solution Training Pads have a 100% money back guarantee. Directions for use: Place the pad on the floor, plastic side down, tissue side up. Introduce your dog to the pad, allowing him to smell the special pheromone-scented attractant. If he doesn't relieve himself immediately, take him back several times until he is successful. When he relieves himself on the pad, reward him with a treat or enthusiastic praise. Replace pads as needed. 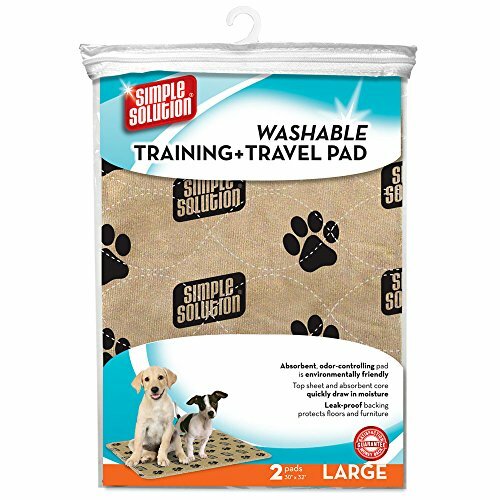 Make housetraining easy with simple solution's washable training and travel pads. These absorbent, odor-controlling pads are minimizing waste from disposable pads. Top sheet and absorbent core quickly draw in moisture, while leak-proof backing protects floors and furniture. These pads hold 10 times more liquid than standard economy pads, allowing for extended use. When cleaning is necessary, simply throw in the washing machine on regular cycle with hot water and one ounce of chlorine bleach to sanitize. Copyright © Wholesalion.com 2019 - The Best Prices On Simple Solution Training Pad Online.